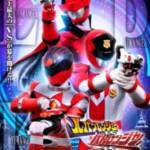 Tokunation › Super Sentai › LupinRanger VS PatRanger VS KyuRanger Officially Announced! LupinRanger VS PatRanger VS KyuRanger Officially Announced! At long last, Toei has revived the Super Sentai crossover special! Current Super Sentai double-bill Kaitou Sentai Lupinranger VS Keisatsu Sentai Patranger will be teaming up with the previous Sentai team, Uchu Sentai KyuRanger! All 12 members of the KyuRanger team are returning for this V-Cinext special film- which means a total of NINETEEN Super Sentai heroes will be fighting together! A brief story outline has been revealed, along with a short teaser. 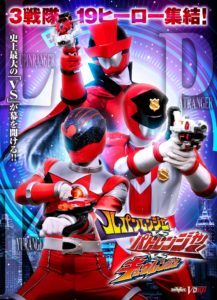 The adventure will begin when the PatRangers are assigned to investigate the sudden disappearance of the LupinRangers- and then encounter the KyuRangers along the way. LupinRanger VS PatRanger VS KyuRanger is currently scheduled for release on August 21 2019! This is going to be a fun movie by the looks of it. ooh i'm really excited! i remember thinking that they had permanantly cancelled these movies after no zyuogher vs. kyuranger, but i'm SO glad i was wrong! i saw the on-set images but i wasn't really sure, especially because of the, you know, rumors about the next sentai (more of the 5 episode special rumor between the current one and the next one), but now i'm super hyped! Back to vcinema direct to DVD because they're not making profit in theaters anymore. So the trailer says August of next year but the post says March so is that a mistake? I guess event still happend within series. Lupins get loved ones back or not no reasons for them to be still a thief and fight Pato when everything end. Trailer was paused and closed at 0:02 for obvious reasons. I really enjoy LuPat but dear lord do I despise Kyuranger. Just hearing this stupid Lucky-character again makes me want to break things. Yay! This is going to be fun! Not sure if we're having a Ryuusouger cameo or not.